OXFORD, Miss. – The renovation and expansion of the Ole Miss Student Union at the University of Mississippi is nearly complete, with plans projecting the “true living room to campus” to be finished by the end of the spring semester. 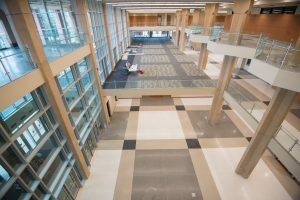 The original 98,000 square feet of the campus student life center, which opened in 1977, was reconfigured and expanded by 80,000 square feet. The addition, which opened in fall 2017, provides an enhanced dining space, five well-known food vendors, kitchens, a transit hub and a large ballroom. Once complete, the renovated original building will accommodate the Student Activities Association, Office of Leadership and Advocacy, Fraternal Leadership and Learning, Center for Inclusion and Cross Cultural Engagement and Associated Student Body offices. It also will include an expanded Barnes and Noble bookstore and coffee shop, conference rooms and a Mississippi Federal Credit Union. “As students can see from the Food Court, second floor or ballroom level, the project has made great strides since finals week ended in December,” said Bradley Baker, director of the Student Union. “The contractors and subcontractors are busy working on their punch lists for the building as well as other items that need to be completed. 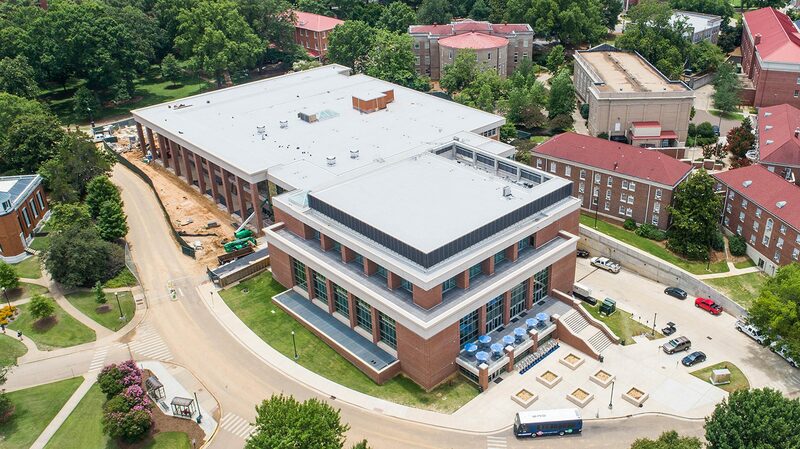 Construction is nearing completion on the Ole Miss Student Union, which opened in 1977. An 80,000-square-foot addition, which opened in fall 2017, provides an enhanced dining space, five well-known food vendors, kitchens, a transit hub and a large ballroom. Photo by Kevin Bain/Ole Miss Digital Imaging Services. “The Student Union renovation and expansion is an incredibly complex project with many moving parts,” Baker said. “This includes both the renovated portion of the old building, as well as the new building, which houses dining services and the ballroom. The project broke ground in 2015, but conversations began long before that. The first phase of construction consisted of retrofitting the building for a temporary loading dock so that Phase Two of the project, the expansion, could begin. The Student Union closed in December 2016 as Phase One was ending so that the renovation process could begin. The original Student Union was constructed in the mid-1970s with the intent of meeting the needs of 8,000 students. The student body needed a place that could accommodate needs ranging from seating options in the Food Court to meeting spaces for student organizations. The completed project will be a hub for student interactions and reinvigorate the heart of the Ole Miss campus. “We are excited to welcome back the true living room to campus later this semester,” Baker said.